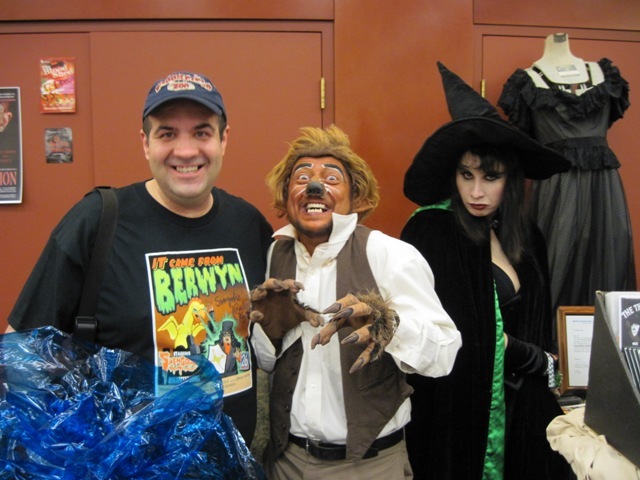 2010 Indianapolis Horrorhound Convention brings in the Horror Hosts! The main hall of the convention was immense. Locating the horror hosts required careful navigation through crowds of people to reach the opposite side. Once there, you’d find an entire section dedicated to them, along with a schedule roster listing their availability. As many of them were also filming excerpts for their own shows or even entire web casts, catching them all would require frequent visits. The first host I had the honor of meeting was Doctor Destruction from Wisconsin. My friend and I saw him earlier that evening while dining at the hotel’s restaurant. It was actually a comical moment; in walked the good doctor wearing full make-up, along with his assistant, Eyegore (photo below). I should mention that Horrorhound was not the only convention taking place at our hotel. A smaller group of Veterans had also convened that weekend, creating a bizarre mix of gore hounds and conservative, senior citizens. When Doctor Destruction entered the restaurant, you could of heard a pin drop as all the elderly patrons suddenly stopped conversing and began staring, awestruck. To ease the tension, I called across the room, “Hi Dr. Destruction!” He nodded in return, though I have no doubt he’d grown used to being stared at. 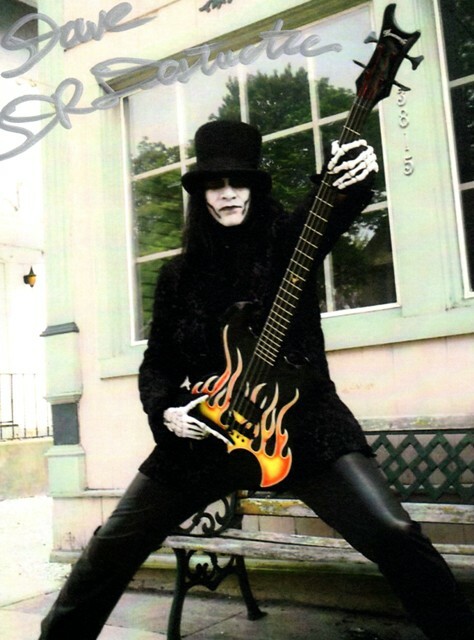 Prior to formally meeting him in the main hall, I had watched some of his “Crimson Theater” shows and enjoyed them. I approached his booth and introduced myself. He was very personable and I was thrilled that, along with his autograph, he was selling copies of his work. He asked which of his episodes I had seen and I responded, VARAN THE UNBELIEVABLE. “Oh God, that’s so old!” he said. He pointed to a stack of DVD’s assuring me that, “These are much more current.” I went through them, buying just about every single title. After Horrorhound, I popped in one of these shows and was shocked at how much his program had evolved since VARAN. The sound quality had noticeably improved and he had expanded his empire from local public access in Kenosha, into Milwaukee, Racine, and Muskego via public access stations. Dr. Destruction has grown quite popular up in Wisconsin with a growing number of fans referred to as “Ghoulies.” He certainly warrants a closer look and will be featured in an upcoming Horror Host Spotlight. The next host I had the privilege to meet was none other than Penny Dreadful herself! This New England hostess was the winner of the 2007 Rondo Award for “Favorite Active Horror Host(ess).” She was also one of six hosts featured in the latest issue of “Rue Morgue.” This is one witch whose ascension can not be credited to a mere broomstick! Smart and savvy, she has used more than an ample bosom to distinguish herself among her horror host peers (though tongue-wagging, male fans won’t be disappointed in that regard either). She will be covered in much greater detail in my next Horror Host Spotlight. Penny was joined by her partner (both on and off the screen) the werewolf, Garou. They were both a lot of fun and delighted me by signing her season 5 box set of “Shilling Shockers.” Garou was a bundle of energy and actually very funny. After I left Penny, I was so enamored with meeting her that I left my autographed photo (duh)! True to his character, Garou tracked me down to bring it to me, which was very nice of him. Prior to Horrorhound, I had watched Penny’s latest, 7th season. My kids and I decided to present her with a gift basket worthy of a witch; rubber creepy crawlies and potions courtesy of the local trick shop. I also included some Svengoolie clips I had burned onto a DVD and the WCIU promo card Svengoolie had signed for her the night before. She graciously reciprocated and that autograph (along with Count Gore de Vol’s) was aired on a recent episode of Svengoolie. 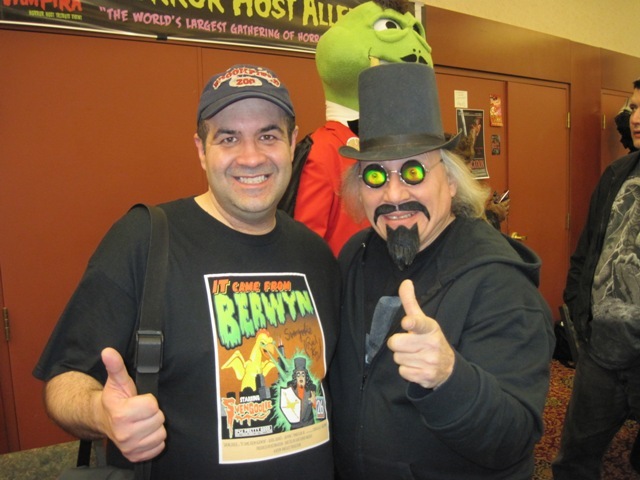 In an effort to support the “home team,” I wore my Svengoolie shirt that first night in the hall. This attracted the attention of another host, and fellow Illinoisan, The Bone Jangler. He was very warm and, despite being an imposing figure, immediately put us at ease. Clearly he loved his status as a horror host as well as being among his peers. 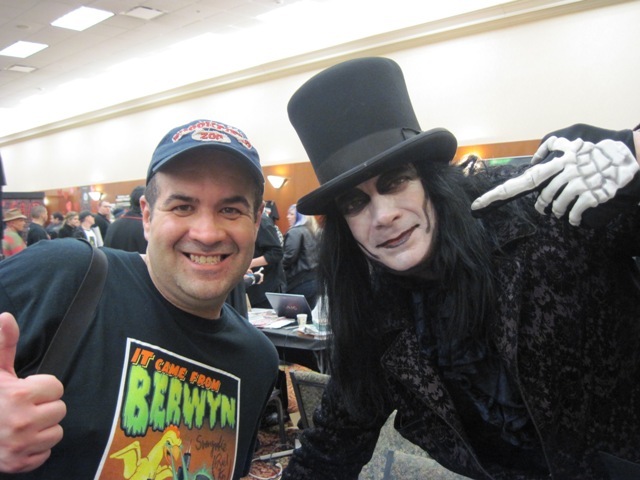 I had recently watched his Web presentation of BLOOD FREAK and we talked about that as well as how disappointed I was at not being able to meet his co-host, Nocturna, who was appearing at another event. Later, I saw The Bone Jangler conversing with the legendary, Son of Ghoul. He noticed me and used the opportunity to introduce me to his famous friend. I thought that was an incredibly nice gesture on his part and I was thrilled to meet the Ohio legend. Son of Ghoul is celebrating his 25th year on commercial television and has legions of Midwestern fans. I found him to be very down to earth and anxiously purchased a stack of his shows. I was alarmed when I heard that he recently suffered a heart attack, but am comforted by the news he’s recovering well. I know there are countless Ohio horror fans that feel the same way. Others I met included Web hostesses Marlena Midnight and her co-host, Robyn Graves from “Midnight Mausoleum.” We also met Helena the Hussy. I had not viewed any of their works prior to meeting them but they eagerly sold me some episodes to rectify the matter. As the night waned, I left the convention hall feeling a great sense of accomplishment. Little did I know, however, it was about to end on an even higher note. Exiting the hall, I noticed a VERY familiar face signing autographs to my right. My evening’s finale was about to be served up…..courtesy of The Mistress of the Dark! This entry was posted in Convention & Expos, Horror Hosts and tagged Blood Freak, Count Gore De Vol, Dr. Destruction, Elvira: Mistress of the Dark, Eyegore, Garou, Helena the Hussy, HORRORHOUND WEEKEND, Marlena Midnite, MIDNITE MAUSOLEUM, Penny Dreadful, Robyn Graves, Shilling Shockers, SON OF GHOUL, Svengoolie, The Bone Jangler. Bookmark the permalink. I was SO HAPPY to find your website! My name is Gail. I live in Milwaukee,Wisconsin. I am 32. I am disabled and live with my mom, Mary. I have Multiple Sclerosis and I am up in a lot of pain during the nights when I should be sleeping. As a result, I get myself out of bed and into my wheelchair. Mom gets up with me, though I BEG her to keep sleeping. She is 77 years old. Through these past 7 or 8 months, we have gotten through my pain-filled nights by watching, DR.DESTRUCTION’S CRIMSON THEATRE. We LOVE IT!!! My MOM LOVES IT ESPECIALLY!!!! ‘BLACKULA’ is our FAVORITE! Mom thinks it is scary and funny at the same time, AND she is a HUGE fan of, Dr.Destruction’s. Oh,Dave…I know you don’t know me at all, but I just HAVE to ask a favor. Mom is SO GREAT to me. She sacrifices EVERYTHING to help me through each day AND night. She is the BEST mom in the WORLD!!!! I would like to ask YOU, is there any way YOU could ask, Dr.Destruction to sign a photo of himself, PERSONALLY, to my mom…for me, to give to her as a Christmas gift THIS year? Something like, “Merry Christmas, Mary! Keep Watching!…Dr.Destruction”…..or something ghoulish added??? Mom would CHERISH it and I would be SO HAPPY to give her such a GREAT, Personalized Gift, from him!!! Please??? Could you ask him? It would mean SO much to my mom AND to me.She is one of his Biggest Fans. I know she would TREASURE such a photo like this!!! Especially with, “To Mary” written by, Dr.Destruction HIMSELF!!! Can you help me? I read that you are his friend? It would mean more than I can say. If not, Thank You anyway. Merry Christmas to you and Thanks for reading this! GOD Bless You & Yours! Gail, Thanks so much for your message and I have already forwarded a copy to Dr. Destruction. I know that he will be happy to accommodate you and I will keep you posted via direct email when he responds. Your story is a moving one, not just in regards to your own personal struggles but the love and appreciation that you have for your mother. 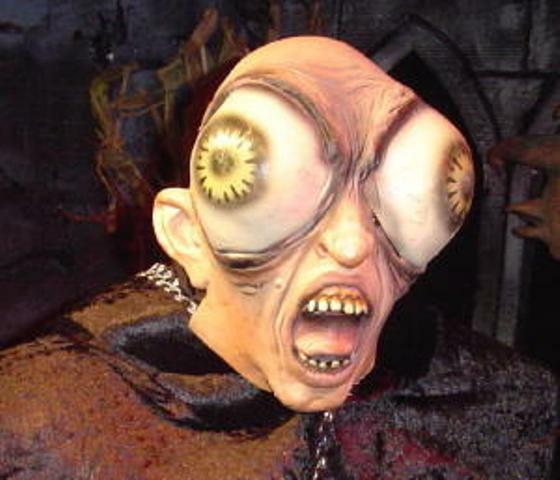 I was also struck by the impact a horror host can have on the people in his/her community. Thank you for this letter and I wish you and your family a wonderful holiday season! Dave F.
Crimson Theatre…AND YOU, Dear Dave!!! Yes, “horror hosts” can be VERY SPECIAL and can touch your heart in ways others can’t. Love to them all…& to You, Dave! !